A.D.P.® supplies a standardized oregano extract which is emulsified and processed in a sustained release form for optimal effectiveness. This statement has not been evaluated by the Food and Drug Administration. This product is not intended to diagnose, treat, cure, or prevent any disease. 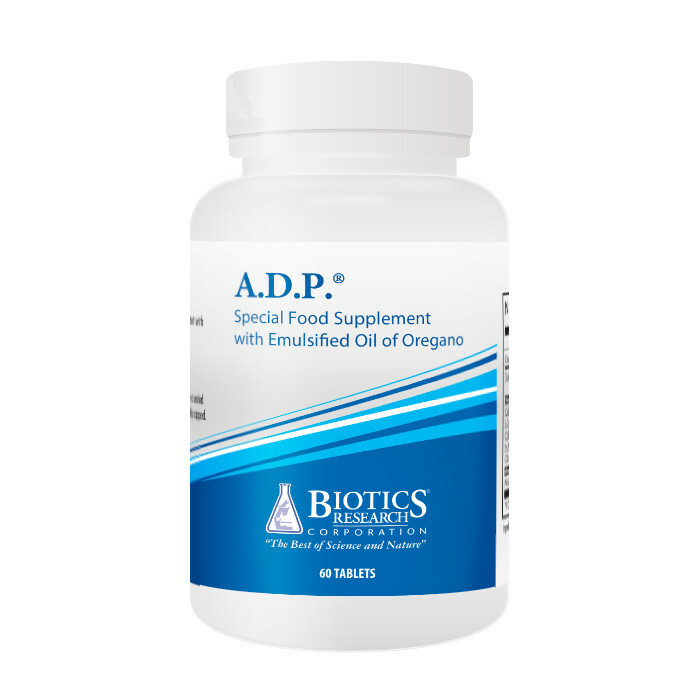 An additional step was to apply a sustained release mechanism to A.D.P., assuring a slow release throughout the digestive tract. The combined effect of emulsification and sustained release is to enhance intestinal exposure to the essential oil. The patent has been issued (#5,955,086) for the "eradication of intestinal parasites and amoebas in humans." Unwelcome guests in the human gastrointestinal tract are more common and have a much greater negative impact on health than is commonly recognised. These bugs range from bacteria and yeasts to parasites and amoebas, hence the need to address these imbalances with anti-microbial agents. Nature contains many different anti-microbials and oregano oil extract, containing the active ingredient of carvacrol, is one of these. It has a broad range of action addressing many different species including B. Hominis but the list includes and is not limited to: Listeria monocytogenes, Giardia lamblia, Staphylococcus aureus, Escherichia coli O:157:H7, Yersinia enterocolitica, Pseudomonas aeruginosa, Aspergillus niger, Geotrichum (yeast), Rhodotorula (yeast), Entamoeba hartmanni, Entamoeba histolytica, Endolimax nana. Avoid or minimise raw food when travelling abroad. Avoid unsafe water sources when abroad or at home. Consider taking a prophylactic natural anti-microbial, such as ADP™ when travelling abroad. One (1) tablet with meals and at bedtime as a food supplement. Do not exceed recommended daily dose. Not to be used as a substitute for a varied diet. Ingredients: Cellulose (E460), Modified Cellulose Gum (E466), Oregano Oil, Stearic Acid (Vegetable Source) (E570), Silica (E551), Water, Gum Arabic (E414), Potassium Sorbate (E202). ADP supplies oregano oil which is emulsified and processed in a sustained release form for optimal effectiveness.